We are a leading Manufacturer of compression type dryer, heatless dryer, heat reactivated dryer, internally heated air dryers and low pressure air dryer from Vadodara, India. In HOC type dryer, hot air at 120-degree Celsius to 140-degree Celsius from Compressor discharge is directly used for the desiccant regeneration. Running cost of this dryer is virtually NIL. It has two drying towers filled with the Activated alumina or Molecular sieve desiccant and they alternate in the process every 4-hour automatically. Compressed air directly from air compressor discharge is taken to air dryer inlet through pipelines at 130-degree Celsius (Min) temperature. 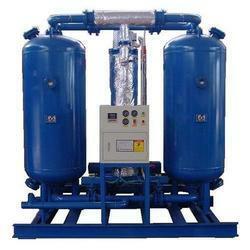 This hot air is passed one drying vessel were saturated desiccant is regenerated by this high-temperature air. After picking up moisture from the bed, this air is cooled in an intermediate cooler. Here moisture is condensed and removed by an auto drain trap. At 40-degree Celsius temperature, this air passes through second drying vessel where moisture gets absorbed and dry air comes out. Cycle time is 4-hours regeneration and 4-hours drying. After 4-hours changeover of vessels takes place. In the regeneration cycle heating of the bed is only for 2-hours and thereafter the bed is cooled by dry air. Dry air is cooled to 40 degree Celsius temperature before going out of the air dryer. Due to NIL operating cost, this design is becoming more popular. To utilize full heat energy of compressor discharge, HOC type dryer should be located very close to compressor discharge. These dryers are recommended only for Dew-Point (-) 40-degree celsius and the capacities above 300 Nm3 /hr. In smaller capacity, the hot air discharge does not reach 140-degree celsius and hence this design can''t be used. No loss of compressed air in the purge. It is a no purge loss design. Maintenance is easy and simple as there are no heaters and no other moving parts except 4 way valves. Fully automatic, continuous operation without any attention of the operator. Negligible operating cost. It neither requires electric power for regeneration nor there does any purge loss of compressed air. Supply Voltage Single Phase, 220V, 50Hz. Wet incoming compressed air or gas is passed through a desiccant bed; the desiccant adsorbs its moisture. After some time of operation, this desiccant gets saturated and needs regeneration. Reactivation or regeneration of desiccant is then necessary to drive-off the adsorbed moisture and to re-store its original adsorptive capacity. This is accomplished via purging the adsorbent by dry air or gas at atmospheric pressure and temperature in reverse direction. 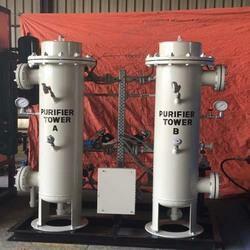 Heatless Drying Unit has two towers filled with the desiccant for continuous drying operation. At a time, one tower is used for drying while the other tower is reactivated simultaneously. After a fixed time of interval, the drying towers get changeover automatically by operation of sequence timer and interconnected valves. Referring to the flow diagram, assume that the left tower is under drying and the right tower is under reactivation. Wet air or gas enters the tower from bottom side, passes up through the desiccant and comes out from the top. A small bleed flow is split from the exit of left tower and enters the right tower at atmospheric pressure. This bleed air pick-up the moisture from the desiccant and vented out to the atmosphere. After complete reactivation of desiccant, direction of control valves is reversed to place the left tower on reactivation and right tower on drying. Low initial installation and operating cost. High performance and almost Zero maintenance cost. Low-temperature operation which reduces corrosion of towers. Only single phase electric power is required. Desiccant life around 3 – 5 years. 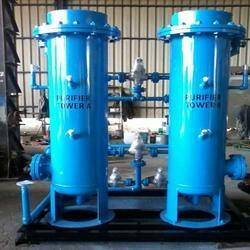 The below capacities are designed at an inlet conditions of 40 degree Celsius temp., 7 – 10 kg/cm2 pr. and at an outlet Dew – Point of (-) 40 degree Celsius. Heat reactivated dryer are used when one needs the air of very low dew point. In this design, desiccant is regenerated at the higher temperature with little dry air purge. Due to dry air purge and thermal regeneration, residual moisture loading on desiccant becomes low and this gives low dew points. The drying unit has 2-vessels filled with activated alumina desiccant. One vessel remains in drying cycle for 4-hours while another vessel is simultaneously regenerated at atmospheric pressure. 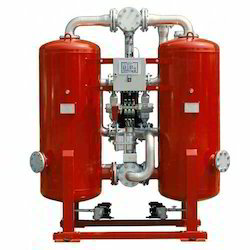 Around 3 to 5% flow of air dryer capacity is used as the purge for regeneration. Electrical heaters are provided in a central finned stainless pipe in drying vessels. Heating cycle is for 2-hours and in this time desiccant temperature increase up to 100 to 150-degree celsius. at this temperature regeneration is complete. Dew point achieved is around and above (-) 60-degree celsius. (-) 80-degree celsius and purge loss are also less than the Heatless type i.e. around 3 %. A fully automatic unit requiring no attention of the operator. Heaters switch on/off and all valves operation is fully automatic. Low purge air requirement as compared to heat fewer type dryers. Counter-current preheated dry air purge provides maximum removal of adsorbed moisture with minimum gas purge loss. As heating is done desiccant life increases because moisture is removed effectively due to heating. 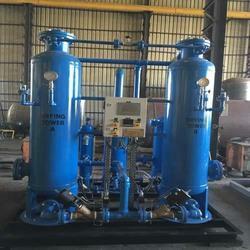 We are offering Low Pressure Air Dryer to our clients.